Emirates NBD has made your bill payments a lot easier with Fawry through our e-payment solution. Now you can pay your or others’ bills through the digital banking channels anytime, anywhere. Emirates NBD e-Payment solution enables a convenient and secure way to pay your bills through Fawry Bill Payments. 24/7 Bill Payment service and instant top up of mobile phones available through Emirates NBD Online Banking and Mobile Banking Application & Branches' ATMs. You can choose the method of payment using either Emirates NBD bank accounts or credit cards to settle your or others’ bills. Different type of bills can be paid using any of the digital banking channels & ATMs instead of visiting different billers and waiting in queues to settle bills. What is Emirates NBD e-Payment service? Emirates NBD is now offering its clients a new e-Payment service through “Fawry Bill Payments solution” that enables a convenient and secure way to pay more than 50 various bills through Emirates NBD Digital Banking Channels anytime anywhere. What are the Digital Banking channels I can use to pay the bills? Different Bills or mobile phones top up can be paid (24/7) through Emirates NBD Online Banking and Mobile Banking Application & Branches ATMs. What are the Bills I can pay using Fawry services? You can pay more than 50 different bills in any of the following categories Telecom & Internet, Utilities, Insurance, Traffic, Tickets & Tourism, Online Payments, Donations and Other Bills. Are there any extra fees for this service? There are no fees applied on the top up of mobile phones. However, other types of bills are charged with fixed fee that will require confirmation to proceed with the transaction. How to make sure the bill is paid? If you paid a bill using the Online Banking or the Mobile Banking Application, you will receive a confirmation e-mail and SMS on your mobile number to ensure a successful payment transaction. Can I use the credit card for the bill payment? Yes, you can choose to pay your bills using any of your accounts or credit cards. How to renew your Traffic License through Emirates NBD Digital Banking Services? 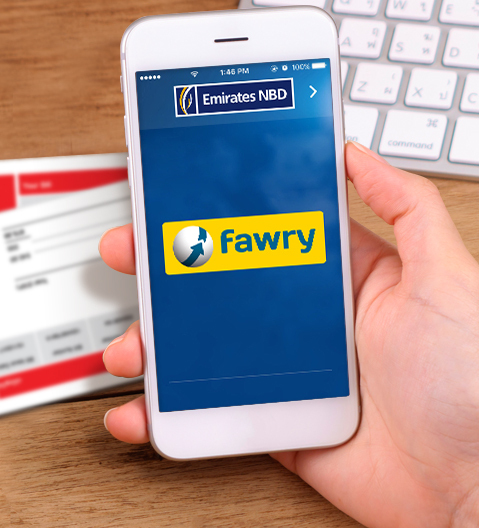 You can renew your Traffic License through “Fawry” on Emirates NBD Online Banking or Mobile Banking Application.